BAGUIO CITY – A mayoralty candidate in Baguio City, a congressional candidate in Mountain Province and an aspirant for municipal councillor in Barlig town were barred by the Commission on Elections (Comelec) en banc from pursuing their candidacies in the upcoming May 13, 2019 mid-term elections after their certificates of candidacy (COCs) were deemed not filed for having used the old form. Resolution No. 19-0286 dated March 6, 2019 stated that the old form does not contain item No.22 as received from Comelec field offices nationwide shall be deemed not filed for being not in conformity with Resolution No. 10420 as amended by Resolution No. 10430. The resolution added that notwithstanding that the names of Baguio mayoralty candidate Edgar M. Avila, Mountain Province congressional candidate Adrian Libang and Barlig municipal councillor candidate Josewon Lippad Oryan are already in the official ballots for the upcoming elections, the said candidates shall not be voted for and any votes casted in their favour shall be considered stray. Earlier, the poll body promulgated Resolution No. 10420 and 10430 to provide for the rules and regulations governing the filings of COCs and certificates of nomination and acceptance. Section 26 which provides the ministerial duty of receiving and acknowledging receipt of COCs and CONAs states that the receiving officer shall have the ministerial duty of receiving and acknowledging the COC and CONA provided that they are filed in conformity with the rules and regulations. Pursuant to the approved Resolution, the Commission En Banc issued Minute Resolution No. 18-1182 dated November 28, 2018 which resolved that some 53 COCs following the old format which lacks item No. 22 as received from Comelec field offices nationwide, shall be deemed not filed for not being in conformity with the rules. After due deliberation, the poll body resolved to approve the recommendation of the law department in declaring that all COCs following the old form that lack item No. 22 as received shall be deemed not filed in accordance to previous approved resolutions. The poll body also decided to impose the appropriate sanctions against erring election officers concerned who failed to observe the non-use of the amended certificate of candidacy in connection with the May 13, 2019 national and local elections. 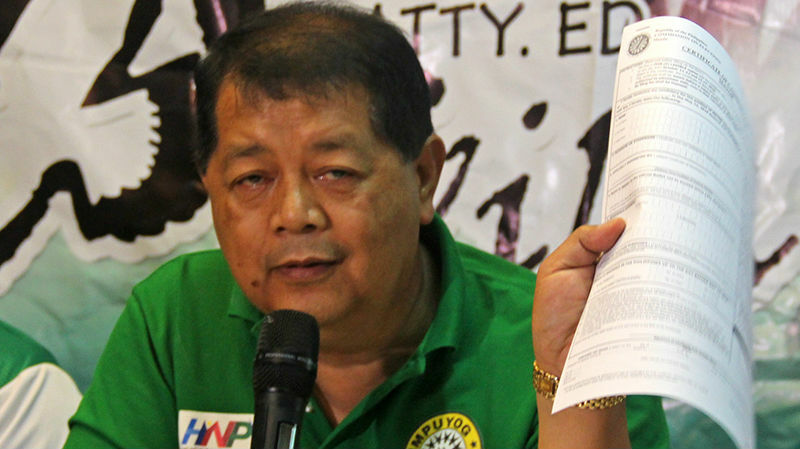 For his part, Avila noted that there was substantial compliance on his part when he submitted his COC and that his camp will take the appropriate available legal remedies to ensure that the matter will be corrected by the Comelec the soonest. He argued that the mere fact that Comelec receiving and acknowledging officers stamped his COC as received, it only means that the same had passed their scrutiny indicating that the COC was complete and pursuant to established rules and regulations. Avila branded the latest development in the city’s political arena as politically motivated because it was done right at the height of the political season but legal options will have to be undertaken for Comelec to institute the needed corrections in their flawed decision.